THE EVENT: One of the most sought after tickets of the charity season, this refined yet casual gathering pairs some of the region’s favorite pastimes – charity, fine wine, and gourmet cuisine – with a list of high-net, high-powered participants. 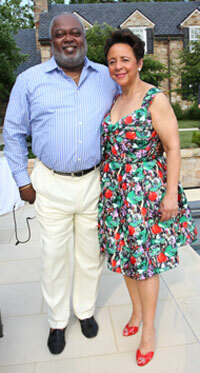 The annual CharityWorks fundraiser was hosted by Sheila Johnson and William Newman at their Middleburg oasis, Salamander Farm. The evening, chaired by Jack Davies, raised over $700,000 to benefit Fisher House, an organziaton providing homes for families while loved ones in the military receive medical care. CharityWorks’ goal for the year is to raise enough money to build a new home on the grounds of the Veteran’s Medical Center in D.C. THE SCENE: Auctioneer Leon Harris had an easy job – simply let the guests enjoy a five-course meal prepared by the region’s top chefs. And the wine? All French, all 100 point-rated by Wine Advocate and Wine Spectator, and all eloquently explained, course-by-course, by Master of Wine, Jay Youmans and wine critic Ben Giliberti. THE GUESTS: Judy and Walter Havenstein from BAE Systems, the evening’s lead sponsor, Rosemary and Michael Laphen, Lisa Lutz, Amy and Pierre Chao, Ted and Lynn Leonsis, Marge and Philip Odeen, Pam and Richard Hanlon, and Art Marks.